George Vancouver went to sea as a fourteen-year old crewmember on James Cook’s second voyage. He impressed Cook and joined him as midshipman on his voyage the northwest coast of America. In 1779, while on this voyage Cook was murdered by Hawaiian warriors. Years later Vancouver led his own expedition to the Pacific coast of America. In command of two ships, a new sloop named the Discovery (named after Cook’s ship on which he had earlier served) and an armed tender named the Chatham, Vancouver sailed for the Pacific via Cape Town. His first assignment was ‘to reach that extent of coast on the south-west side of New Holland, which in the present age appears a real blot in geography’. On 28 September 1791, with sick crewmembers aboard, he decided to make land as soon as he could locate a suitable harbour. This he found when he entered a large protected stretch of water that he named King George the Third Sound. Foremost in Vancouver’s mind, once he was safely anchored near Seal Island, was to find potable water. A boat went ashore near the site of the present day ‘Discovery Bay’ whaling museum and his crew found a stream yielding water that although ‘nearly of the colour of brandy, was exceedingly well tasted’. Later Vancouver located the clear freshwater streams that a decade later provided sustenance for the French at nearby Whaler’s Beach. Prominent topographical features around the sound were named by Vancouver and are still in use today: Bald Head, Limestone Head, Breaksea Island, Michaelmas Island, Seal Island, Green Island, Point Possession, Princess Royal Harbour, Oyster Harbour so named because his boat grounded on a banks of oysters ‘of a most delicious flavour’. Vancouver’s mission had exploratory and scientific purposes. His ships were not as well equipped as later French vessels though much was achieved. Archibald Menzies served as the ships’ surgeon but also doubled as the expedition botanist, tasked with collecting exotic species for the botanists at Kew. Visiting Frenchman Bay in September the scientists were no doubt impressed by the display of wildflowers. Many of the species growing around Frenchman Bay that were collected during Vancouver’s visit have scientific names that signify they were taken to Kew as part of Menzies’ collection. Vancouver’s stay in the Sound lasted 17 days and his scientists and cartographers explored the waters and land around present day Albany. After leaving King George Sound he sailed eastward and eventually reached the northwest Pacific. He arrived back in London in 1795. His epic voyage had lasted nearly four years. During that time he surveyed the coast of present day British Columbia. The quality of his mapping was widely acclaimed. When later explorers visited King George Sound they had in their possession charts drawn by Vancouver. The journal of his stay makes interesting reading and is widely available. See Douglas Sellick, First Impressions Albany: Travellers’ Tales 1791 -1901, Western Australian Museum, Perth, 2000. Given command of the Investigator, a vessel about the same size as Vancouver’s Discovery, Flinders was instructed to survey the ‘Unknown Coast,’ a reference to the southern coast of Australia. Vancouver, following his stay at King George Sound, had sailed directly to the east coast of New South Wales, leaving the southern coast of Australia uncharted. Flinders was instructed to sail to Port Jackson on the east coast of New South Wales and refit his ship before returning to the south coast. The British authorities were aware that the French under Baudin’s command had already set sail and wanted to lay claim to territories that were of economic or strategic importance. En route from Cape Town, Flinders headed to King George Sound, aware from examining Vancouver’s charts and journals, of the fresh water streams and safe anchorage that awaited him. He arrived at the beginning of summer on 9th December 1801. Unlike Vancouver, Flinders opted for a more protected anchorage than was afforded by Frenchman Bay. 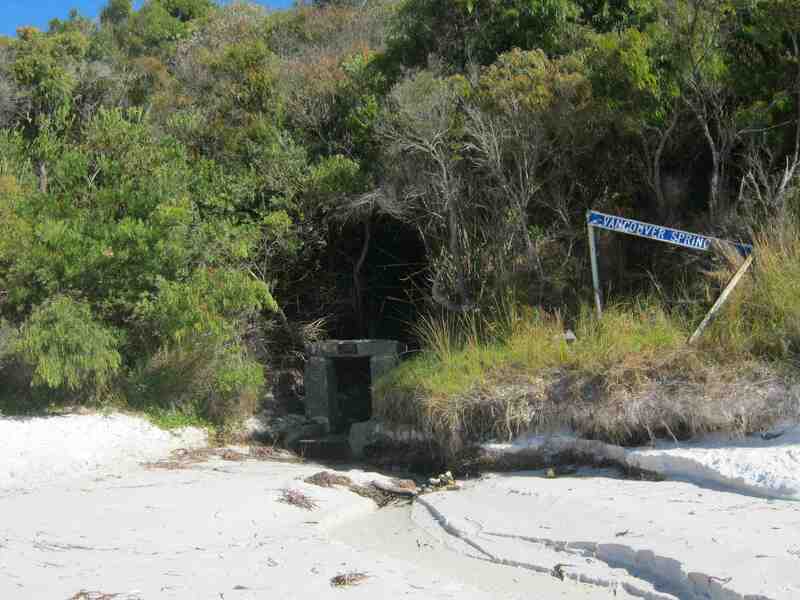 He anchored in Princess Royal Harbour near the present day Albany harbour frontage. The following day, he and his scientist, set off to collect botanical specimens in the vicinity of Bald Head. Later, he landed on Seal Island to search for a bottle containing a parchment that had been left by Vancouver but it could not be found. The following day Flinders landed on a small island in the middle of Oyster Harbour on which Vancouver had optimistically planted vegetables, hoping that if the ‘garden’ thrived, visiting sailors could replenish their stores. Uncared for, Flinders found that the garden had been overgrown with native vegetation. Near the entrance to Oyster Harbour Flinders found a small cleared patch of ground in which a piece of copper was found bearing the inscription ‘August 27, 1800. Chr. Dixson – ship Elligood’. The Elligood was a British whaler that had been commissioned by the British Government to assess the whaling potential of the coast around the Sound. Flinders surmised that it was the crew of the Elligood that had removed Vancouver’s glass bottle from Seal Island. Unlike Vancouver, Flinders made contact on several occasions with curious Noongyars whom he referred to in his journal as ‘Indians’. Relations during these encounters were friendly and gifts were exchanged. Midway through his stay, in late December, Flinders and a party of a dozen others including the scientists, set off on foot to explore the area Princess Royal Harbour to present day Torbay, examining the vegetation, lakes and wetlands. The party had provisions for a two-day march but on the second day with soaring temperatures they began to run out of water. One of the party was affected with heat stroke. Eventually they all made it back to the base camp. 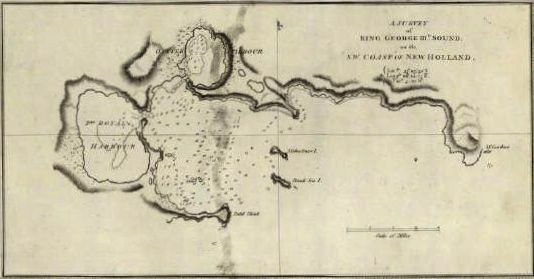 Altogether, Flinders spent nearly a month in King George Sound during which he named various topographical features including Mistaken Island. His artist, William Westall, made many sketches of the features in King George Sound. 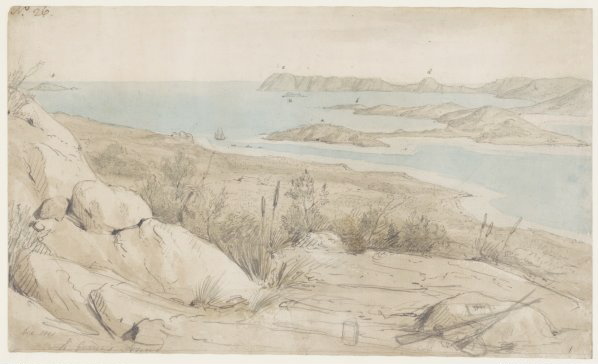 In the accurate watercolour sketch shown above, Westall has captured the view from the site of present day Albany looking towards Bald Head promontory that can be seen in the background. Frenchman Bay is in the mid-ground. On 4th January 1802 he headed out to sea and resumed his circumnavigation of Terra Australis. King George Sound had been the site of his first landing and beginning of the circumnavigation. As he explored and charted the south coast Flinders encountered the commander of the French expedition Nicolas Baudin, also in possession of Vancouver’s charts, heading towards King George Sound. Like many of the early seafarers who visited Frenchman Bay, Flinders voyage had an unhappy ending. Detained unfairly as a British spy by the French on Mauritius from December 1803 until June 1810, for nearly seven years he was prevented from circulating his charts and account of his epic circumnavigation.